It’s been over 60 years since dogs were first pressed into service in the Indian Army in 1959. And since then, thousands of dogs, depending on their breed and aptitude, have been given rigorous training in explosive detection, mine detection, tracking, guarding and assaulting at the Remount and Veterinary Corps (RVC) Centre and College in Meerut. Dogs have been integral to the Indian Army ever since but so has been their participation in conflict world over since ancient times; from war dogs trained in combat to being used as scouts, trackers, sentries, they have had multiple uses continuing to modern military times. There is mention of war dogs used by the Egyptians, Greeks, Persians, Sarmatians, Baganda, Alans, Slavs, Romans and Britons in ancient times. Dogs find mention during the conquest of Latin America, Spanish wars in the Caribbean and by the English in the Middle Ages. The British used dogs when they attacked the Irish and the Irish in turn used Irish Wolfhounds to attack invading Norman knights on horseback. Two wolfhounds, or even a single one were often capable of taking a mounted man in armour off his horse, where the lightly armed handler would finish him off as necessary. In the late 1940s the Viet Minh used anti-tank dogs during fighting in Indo-China War. There are also reports of the Japanese Army running a number of dog training schools for training dogs in demolitions in the past. Approximately 5,000 US war dogs served in the Vietnam War and the dog units called K9 Units were estimated to have saved over 10,000 human lives. Some 232 US Army dogs and 295 handlers were killed in action during the war in Vietnam. During World War I, the American Sanitary Corps used dogs to locate wounded soldiers. The two world wars saw use of dogs to detect mines, explosives, booby traps, and also to locate camouflaged enemy snipers, in addition to using them as messengers. But it was the Soviets who in World War II (1941 – 42) used dogs effectively as anti-tank weapons, with explosives strapped to their backs. Anti-tank dogs were used extensively against the German tanks on the eastern front in World War II. According to reports, some 40,000 dog were deployed by the Soviet army, mostly for anti- tank operations. In modern times, US Special Forces (USSF) and Navy Seals are known to use dogs extensively in combat especially in Iraq and Afghanistan. Both the dog and the handler are also trained to parachute down into the conflict zone. During the raid to kill Osama-bin-Laden in 2011, US Navy’s Seal Team 6 used a dog, a German Shepherd named Cairo. The 2008 Mumbai blasts left the country in shock. But what came through for the city were the heroes who helped squash the attackers and save many during that fateful 26th November night. Amongst those heroes, were three Labradors. The world remembers and honours the soldiers who put their lives in jeopardy to keep their nation standing, and these extraordinary pursuits along with the help of the man’s best friend. If we are leading a safe, secured, and peaceful life, it’s because of the chivalrous soldiers guarding us relentlessly at the borders. Irrespective of what we say or how much thanksgiving we offer, their gallantry and bravery remains unmatched. The brave soldiers stand tall at the borders just to safeguard the nation and its dwellers. That’s not all; they are the ones to come forward and secure the nation’s integrity during wars and other emergencies. These soldiers find the best support in the K9 Army, where the canine partners emerge as a great support system for these courageous men and women. 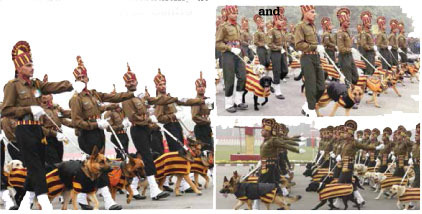 As Indian Army’s 36 Labradors and German Shepherds walked down Raj Path during the Republic Day Parade without missing a step in livery of the Remount Veterinary Corps (RVC), wonder how many in the audience knew they had been practicing three times a day since the last four months for the parade. Joining the parade 26 years after similar previous participation, their movements were immaculate despite the fact these dogs are trained for combat situations, not ceremonials. The dedication and bravery of the Remount Veterinary Corps (RVC) can be guaged from the fact that the RVC is decorated with on Shaurya Chakra and some 150 commendation cards. Our war dogs have done a sterling job in foiling insurgency operations in Jammu & Kashmir, northeast India, and the maoist belt. The RVC has trained dogs for security forces operating in all insurgency regions. Special qualities of sniffing, hearing, seeing in the dark, and loyalty to the trainer make dogs natural to warfare tactics. They have performed admirably in recovery of mines, munition, IED, patrolling and recovery, and search and rescue missions. While young and energetic, these dogs are assets for the army and the police forces, but as age catches up with them (sooner than it does for us), only a few are lucky to be with their old handlers. Most of these canines die at the age of 10-13 years because of ailments from inhaling chemicals and gun powder while on active duty. 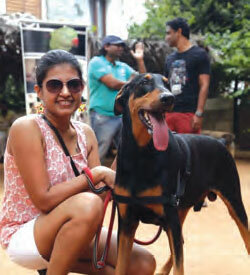 While in service, these dogs are paid Rs 15,000 per month, which is largely spent on their food and medical expenses. But their post-retirement pension is as negligible as their overall care and protection post retirement. This means that these dogs depend on comrades in the shelter. This needs to be reformed—Bravery & Dedication cannot be ignored or abandoned. Salute to the undying spirit of our canine war heroes. They serve the nation and are the pride of our nation. It’s time we all recognise their efforts and bravery and give them a life of dignity even after retirement. Rex: A golden Labrador serving with 14 Army Dog Unit of Delta Force in J&K performed magnificently. In 1995, Rex tracked an injured terrorist for over three kms under intense exchange of fire, recovering an AK 56 rifle and 92 rounds of ammunition. Again in 1998, Rex tracked an injured terrorist after an intense encounter over mountainous terrain and traced him to a cave. He was decorated with GOC-in-C Commendation Card for his outstanding and exemplary performance against terrorists. Unfortunately, he succumbed to serious intestinal injurie he suffered during a fall in 1999. Rocket: In 1998, during an encounter with militants in Kashmir, the Indian army looked to army dog Rocket to get to action. With his exceptional smelling sense, Rocket was able to track down terrorists over 12 km away near the Banihal Pass! The terrorist apparently dropped a scarf, which helped Rocket sniff his way to the militant and ultimately also recovering one universal machine gun, three AK 47s, 2 AK 56s and over 1500 rounds of ammunition from the militants. It was said that this was a record haul by any dog! Prince: The hero of 26/11, Prince was able to detect four live bombs and 17 hand grenades on that fateful night. Three days after the attack, he also detected a live bomb in a bag at the Chhatrapati Shivaji terminus. He was also able to detect a bomb inside an ice-cream during the 2006 serial blasts. Manasi: Manasi, a four-year-old Army Labrador, and her handler were a part of the team that tracked down and killed a terrorist on Kaisuri ridge in May of the same year, as well as foiled another terrorist insurgency in July. On a late evening in August 2015, Manasi sensed the movement of some militants along the LoC in Kupwara’s Tangdhar sector and immediately started dragging her handler Bashir Ahmad towards the target. The search operations took place under conditions of poor visibility and unfortunately, both the dog and handler were killed in a hail of gunfire. Dot and Misha: Not many would know their contribution to India’s security albeit some may have noticed in the media that avalanche rescue dogs Dot and Misha in 2016 were part of the massive operation mounted by the Indian Army at Sonam post located in northern glacier at a height of more than 20,000 feet. After a massive avalanche 10 soldiers of 19 Madras Regiment were buried under 30 feet of ice, and these two helped the team of rescuers.